When I was originally going through the challenge, and saw that these two dates were so close, I had an idea to combo them up. Snakeskin and flowers. Yup. 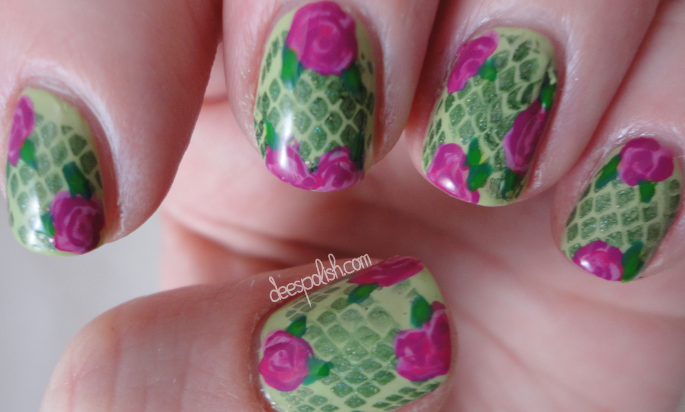 My stamping is rough.. and my roses don't have enough colour definition.. but I know where my faults are.. I think this could actually look amazing if I execute it better -- next time, I tell ya! And this post will be going up on my dads' birthday!! I don't think he really reads this blog, but, if he ever stumbles across it: HAPPY BIRTHDAY SKLIM!! Also, the last two days of the challenge were 'Simple' and 'Galaxy', I didn't do either. Fail. I am looking forward to see if there is a challenge set forth for April. I will be ready for it!